It's a new month and the first Saturday in February and now it's time to share your critters.. Any kind of critter will do, even a new or old post.. I appreciate everyone who has linked up in the past and for those who are linking in on this week's critter party. And of course I always appreciate my blogging friends stopping by just for a visit. A female Downy Woodpecker on my pergola. A few Cedar Waxwings have been showing up..there must be some berries they like nearby. 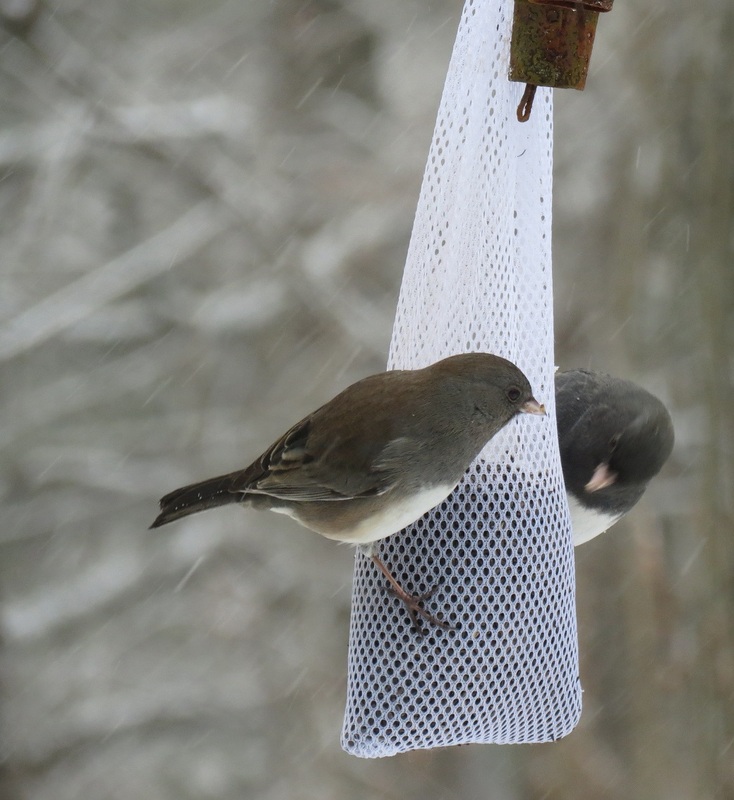 A couple of Dark-eyed Juncos on the thistle sock feeder. 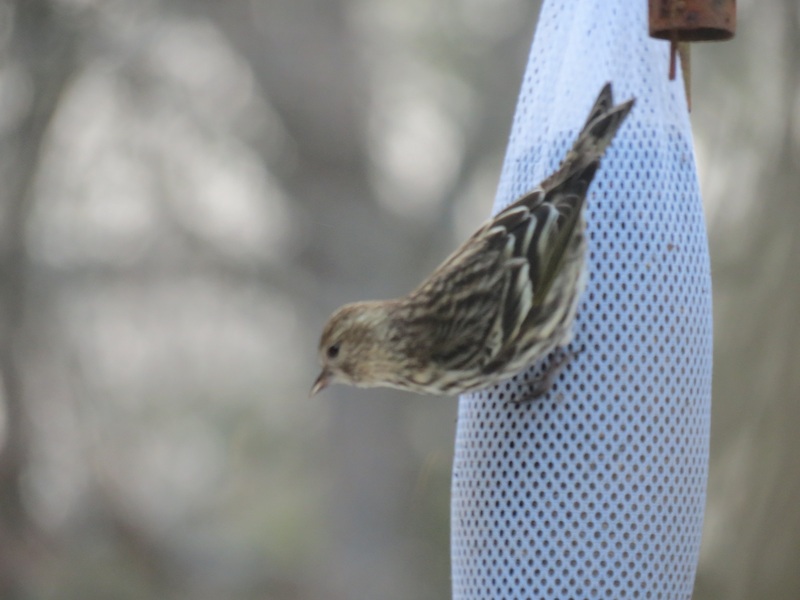 The one and only Pine Siskin I have seen on my feeders this year.. I have plenty of Mourning Doves hanging around..
One of my more popular feeders with some House Finches. Since I've retired and I am not always able to get outside for my walks I use my treadmill everyday and watch the birds outside the window while walking.. On this day the Eastern Towhee stopped by..I hope you enjoyed my birds and post..Again I thank you for linking up to the critter party. I also appreciate the visits, comments and the support of my blogging friends................... Have a happy weekend! Thanks to Tex Theresa aka Tex, I was able to add this link up button and thanks to Jennifer for creating my photo badge. You are teaching me my birds! I'll be back with my critters. . . . . I was so interested in your birds. I love the feeder for the finches. We have a lot of pine siskins here. Unfortunately I do not have a cardinal. Great photos. Your doves are very beautiful with the ring around the eyes. Nice collection of birds and feeders, Eileen. I've not seen the Eastern Towhee before. I love your cute yard birds. The woodie is a beauty. Thank you for hosting, Eileen. I wish you a wonderful weekend. Eileen, these are excellent pictures ! That's nice to see all thses beautiful birds ! What a great selection of birds Eileen, and super photos of every one. If I could see so many birds whilst looking through my window, I would definately use my treadmill more. :) That Eastern Towhee is a lovely little bird. 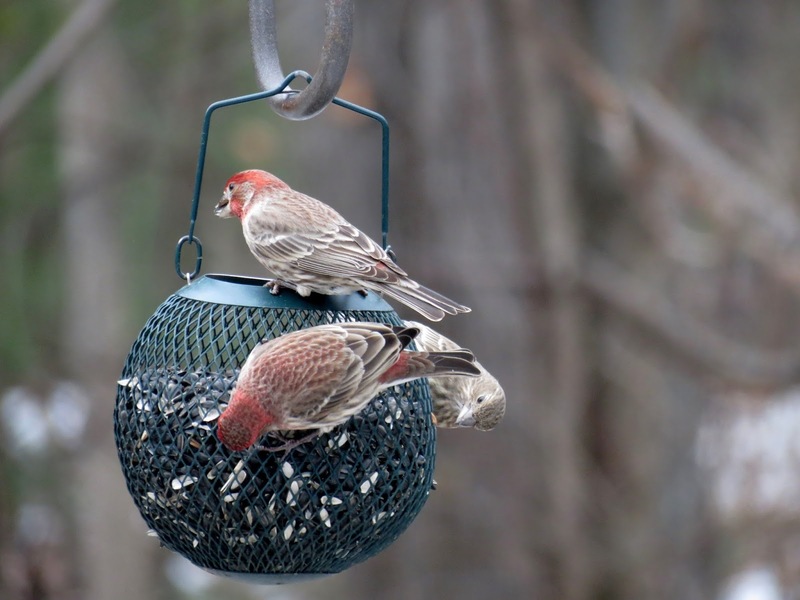 Great photos of the cardinals, woodpeckers and finches. I enjoy very much here. Beautiful pictures you have made of these birds. I wish you a very nice weekend Eileen. All your bird pictures are terrific! Congrats! Beautiful series of images of the birds. 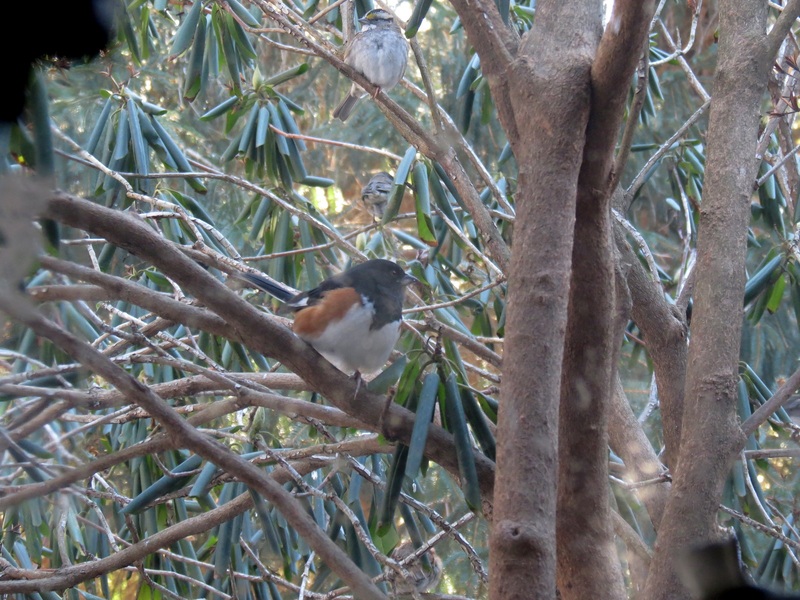 A Towhee, be it Spotted or Eastern is one I WANT to get a photo of someday!!! Lucky you. Eileen-you're going to have to get a pair of "stabilicers"---they are terrific for walking in icy weather. A lousy day outside is always better than a treadmill-LOL! 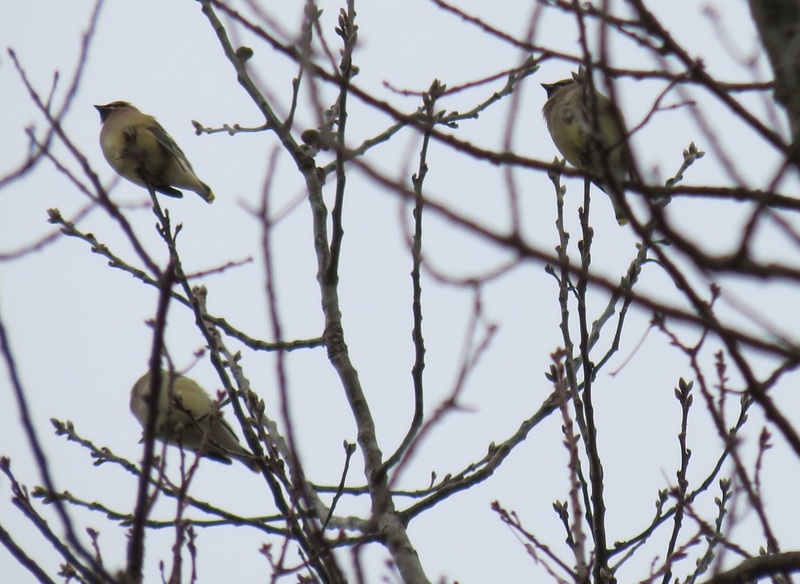 Lucky you seeing some waxwings. We've been keeping an eye on our berry bushes/trees. So far, only a bunch of grouse......which are neat anyways! Such beautiful birds visiting your yard! Excellent shots!My favorite is the woodpecker and the cardninal! Beutiful photos, but the fisrt one is amazing!!!! You have a nice variety of birds at your feeders, Eileen. I have never seen a Towhee at my feeders! A lovely selection of visitors to your garden. I particularly like the Downy. Have a great weekend Eileen. Love the snow shots, especially the Downy! 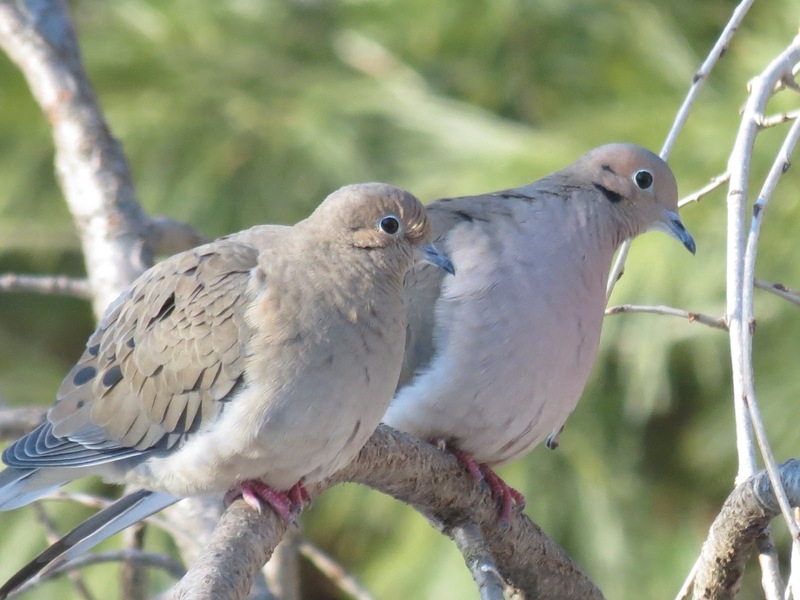 Great dove pair, too! You have beautiful birds in your yard ! Have a nice weekend! 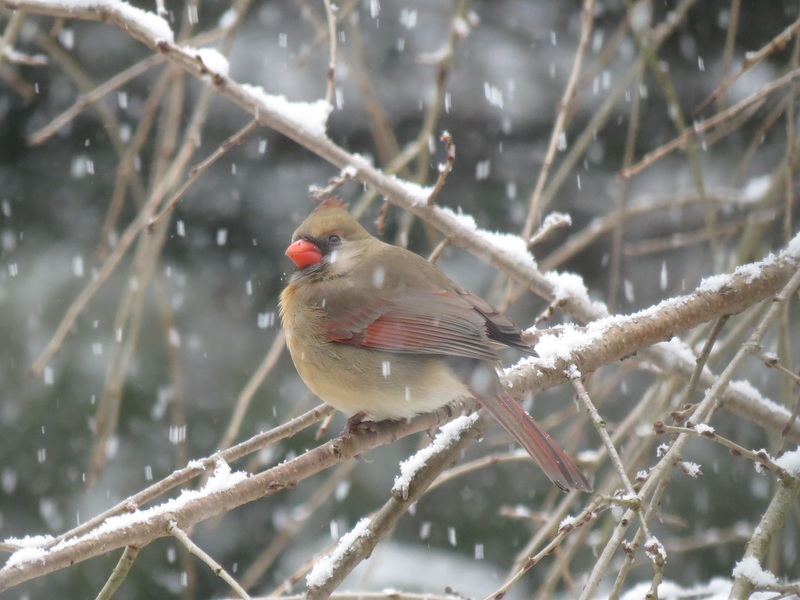 You have some very pretty yard birds - look lovely against the snow. Thanks for sharing them and making this meme available. Glad I found it. It would appear we have the same variety of birds at our feeders Eileen, except the towhee. Of course unless you're always watching or at the window at the right time, there could be visitors that are missed. I know the siskins hang out with the goldfinches and from a distance at our niger feeder, they're hard to tell apart. Thank you very much for your sweet comment, Dear friend. I was busy today having soba guests, I'll start visiting friends tomorrow. Night Night from Japan. All nice photos but I am partial to the female cardinal. They have such soft tones in their plumage. The snow looks so appropriate in contrast to her warmth. A great set of photos Eileen. Even though it is snowing both the Cardinal and the Downy Woodpecker make for lovely portraits. Thank You for hosting once again and do enjoy your weekend and next non-working week! Love the Critter Looks . . .
Like the round ball feeder . . . Whenever I introduce a new feeder it takes them days to forgive me! lots of little feathered critters!! i love the downy and the snowy cardinal!! :) happy saturday! It's lovely to watch the birds at the feeder isn't it? We see all the same birds but not the towhee. It's a snowy day today so the feeders will be busy. Love the photo of the doves! Beautiful all of them! Keep them well fed during these cold months. Thanks for sharing some of the birds that visit your yard. Happy Birding Eileen! How absolutely lovely to see all the birds. I am determined to put up feeders and a birdbath next winter. For now the suet will have to do.....and what a surprise to see Cedar Waxwings. I love them and miss seeing them. I hope to have a story about them soon to share. So many feathered visitors. They are always appreciated. I don't have a nature focus on my blog, so I have nothing to link today. But I am drawn here by the peace and beauty of your work. This place is such a serene oasis amid the chaos of life! You have wonderful garden birds and I especially love the House Finches which are a bit like our Redpoll. Many thanks for linking me in. I forgot and its my birthday! I must be getting "old"!! Thanks for hosting. Lovely birds, Eileen! Thanks so much for sharing. You have a great view from your treadmill! You have so many pretty shots! :) I haven't taken too many this year but finally did the other day / happy to have something to link up, critter-wise. oh eileen, you have quite the set up there in your yard!! lucky birds, you sure do get a great variety!! have a wonderful weekend, i don't think we will be getting any snow!!!! What wonderful shots. I've recently had a lot of mourning doves around my place. What a treasure trove your backyard is for birds ~ magnificent photos! I always enjoy your critter views! Good work on the badge too! Enjoy your weekend. Bela coleção de fotos lindas!!!! Love your yardbird shots. Wonderful varieties. Love the first one. She looks nice and warm all puffed up in the snow. Pretty birdies..Since I'm new at this Linking thing and pretty stupid :)..Could you tell me how to put your badge at the bottom of my post? I know how to add it to the side bar but can I use it in my blog the day I want to link to you?? Enjoy your weekend..
Great bird photos, especially of the doves. Neat critters post ... Very Nice! Have a great weekend. fantastic photos of the different birds in the Wintertime. My favorite is the woodpecker. Amazing ! Have a nice and cozy weekend, Eileen. Those are very beautiful birds and photos. I like them all. I particularly dig your bird feeders. We have some squirrel proof ones in our yard and deck. As I am composing this comment (and while I was composing today's post), I was listening to the bird calls and the chimes. It is a gorgeous day out - hope y'all have a lovely weekend! Eileen, what a bevy of backyard visitors, especially the pine siskin. Thanks for sharing. Having a great view through the window makes the treadmill less boring. These are beautiful shots of your feeder guests. Wonderful bird photos Eileen. Thanks for hosting. As always Eileen, your photos are a delight. The Cardinal with the snow flakes would make a lovely Christmas card for next year. Your photos are beautiful and amazing! I love the cardinal with the snow coming down. An array of the birds, well taken Eileen. Hello, I love all of your gorgeous birds. Birds seem to bring the winter season back to life again. I enjoyed all of your photos of the feathered visitors to your yard. jWe have many Pine Siskins we'd be happy to ship your way if you want them. Very nice pics. Love the little woodpecker. So cute.. Regards from Spain..
What a super set of birds and brilliant pictures Eileen. Have a great weekend. Pretty birds! I'm always amazed how they make it through a cold winter. Beautiful photos, Eileen! I love the Mourning Dove pair and the chubby cardinal. Glad to link up this week! have a lovely happy fun weekend!! We mostly don't feed birds in Australia - they don't need it - so I always find it interesting to see the different feeders people in the U.S. and Europe have.I like the idea of using the treadmill while birdwatching through your window. Very nice series ! Love the woodpecker ! I do envy you for all the variety of birds you get at your feeders in the winter! Your bird park is very busy even in a winter. Your visitors look a lot like the ones that we see. These are beautiful. My favourite is the second last. The female Cardinal has such lovely peachy colors, and the other birds are so irresistable, some are the east coast versions of some of mine. So cute! 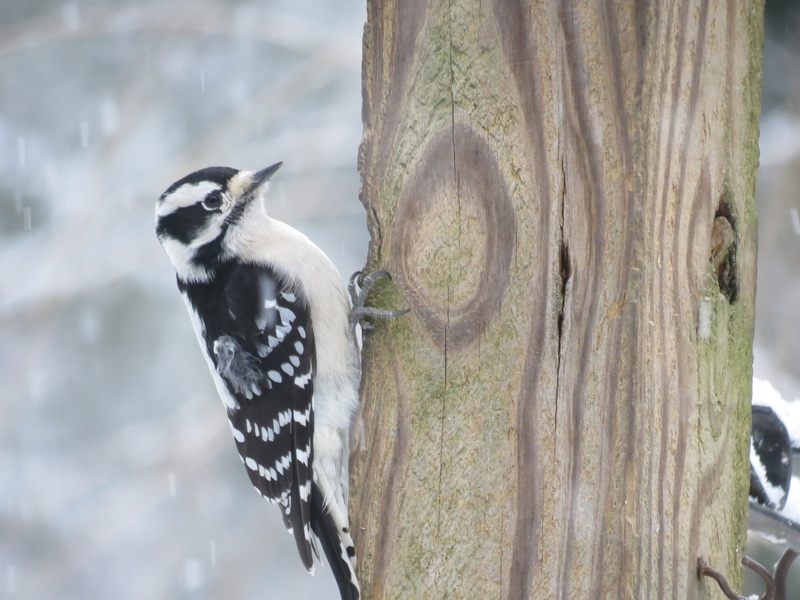 This Downy Woodpecker has such a cute face with its short beak..... compared to our Greater spotted woodpecker! What a lovely photo!! Keep well Eileen, hugs from France! I'm so happy you decided to share this link for the weekend!! GREAT post Eileen. I can think of nothing lovelier than having a snow day at home watching the little birds enjoying the feeders, I especially love the Doves! Wonderful visitors! Especially love those gorgeous juncos! Greeting from belgium, your fotos are always gorgeous.Have a good evening. Beautiful assortment of bird shots!